Bloggers are now finding themselves prey to censorship from repressive governments as much as journalists in traditional media, a report says. Reporters Without Borders' annual study of press freedom says China is one of the worst offenders, having imprisoned 50 people for postings on the internet. The report says governments realise the internet is now a key tool in promoting democracy and are moving to curb it. Eritrea was ranked bottom on overall press freedom by the pressure group. The African nation took the 169th slot on the sixth annual worldwide press freedom index, behind North Korea at 168th and Turkmenistan at 167th. "There is nothing surprising about this," Reporters Without Borders said in a statement. "Even if we are not aware of all the press freedom violations in North Korea and Turkmenistan, which are second and third from last, Eritrea deserves to be at the bottom. "The privately-owned press has been banished by the authoritarian President Issaias Afeworki and the few journalists who dare to criticise the regime are thrown in prison. We know that four of them have died in detention and we have every reason to fear that others will suffer the same fate." The annual index includes 169 countries and was compiled by questioning journalists, researchers and jurists around the world, along with freedom of expression and human rights groups. A number of countries slipped down the index because "of serious, repeated violations of the free flow of online news and information," Reporters Without Borders said. According to the group at least 64 people are currently imprisoned worldwide because of postings on the web, eight of them in Vietnam. 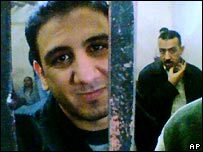 They flagged up the case of Abdel Kareem Soliman, an Egyptian blogger jailed for four years after he used his web log to criticise the country's top Islamic institution, al-Azhar university, and President Hosni Mubarak, whom he called a dictator. "The governments of repressive countries are now targeting bloggers and online journalists as forcefully as journalists in the traditional media," the group said in its statement. "We also regret that China (164th) stagnates near the bottom of the index. With less than a year to go to the 2008 Beijing Olympics, the reforms and the releases of imprisoned journalists so often promised by the authorities seem to be a vain hope," it added. The group said it was "particularly disturbed" by the recent government suppression of Burma's pro-democracy movement. "The military junta's crackdown on demonstrations bodes ill for the future of basic freedoms in this country. Journalists continue to work under the yoke of harsh censorship from which nothing escapes, not even small ads," it said. The highest ranking on the index went to Iceland, followed by Norway and Estonia. Overall Europe performed best, though Russia, which was ranked 144th on the list, is not progressing, the report said. The murder of outspoken Kremlin critic Anna Politkovskaya and the failure to bring her killer to justice weighed heavily, as did a lack of media diversity, Reporters Without Borders added.